Bored of having a hodgepodge collection of screwdrivers flying around? 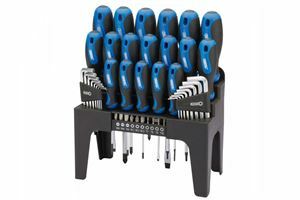 Revitalise your tool collection with these top-drawer screwdriver sets. In order to help you narrow down the potential options, here are ten of our favourite screwdriver sets. If you’ve not got a vast budget and just want something for the odd job then this Draper set could prove perfect. 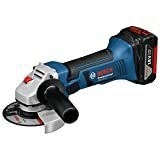 It comes with a driver, which you simply slip bits into then use to screw or unscrew things, and 44 different bits – so you should have no difficulty finding something that can tackle the screw at hand. It usually sells for well under £20, too, and comes with a neat storage case. 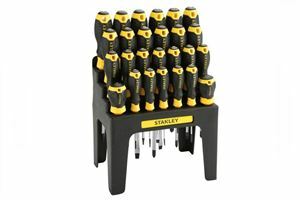 If you’re looking for a big collection of screwdrivers in an easily transported carry case then this affordable Stanley set could be just the ticket. It features 13 screwdrivers, two of which have Torx tips, and a bit-holder screwdriver with 20 bits. Consequently, like the Draper Tools set, it should cover all the bases. This comprehensive set is often available for under £20, too, making it ideal for those not looking to spend a fortune. 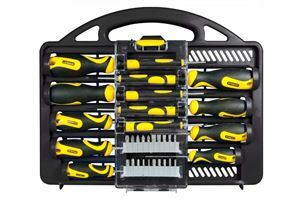 If you’re not interested in having a load of random bits and a driver flying around then this straightforward screwdriver set could be ideal. 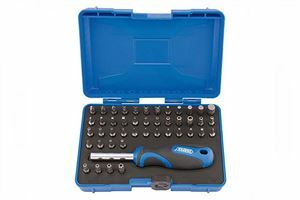 It features 26 screwdrivers, with a range of tips including Pozdriv and Torx, in a variety of sizes – so you should easily and quickly find a screwdriver capable of tackling the job at hand. Like the Draper set, it also comes with a useful storage rack that’s ideal for a workbench or shelf. Draper is a well-respected brand and this inexpensive set is ideal for anyone looking to start building up a collection of tools. 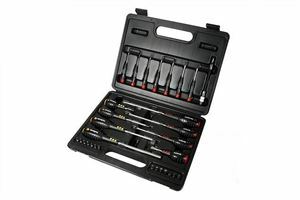 This extensive set of screwdrivers and bits should cover most people’s requirements, be it at home or in the garage, and it also comes with many other useful accessories – including magnetic pick-up and a flexible extension shaft. 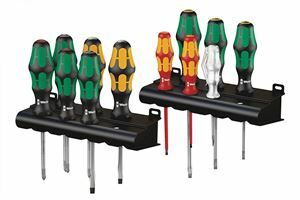 You also get a selection of precision screwdrivers, which are ideal for taking apart smaller devices and machines. 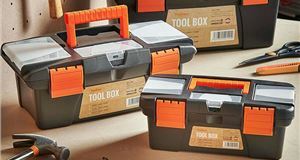 If you’re in the market for affordable and high-quality tools then it’s always worth checking out your local branch of Halfords – as its ‘Advanced’ range offers excellent quality in conjunction with a lifetime warranty and sensible pricing. 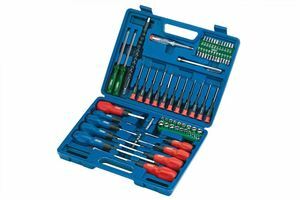 This comprehensive set comes with several screwdrivers, including smaller precision ones for working on things such as electronic devices, and a bit driver with numerous bits. It also includes a carry case, which will help keep everything in check and protect it from damage. 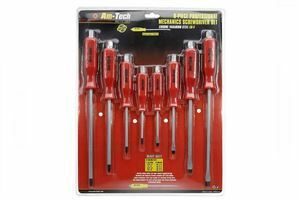 This inexpensive set of Draper screwdrivers is ideal for anyone looking to start building up a collection of tools. Besides a comprehensive array of Philips and flat-bladed screwdrivers, this collection also includes a bit driver, several bits – including Torx and Pozidriv – and numerous Allen keys. You also get a neat storage tray, which should help stop things wandering off into the ether. A lifetime warranty is standard, as is often the case on all Draper hand tools, so problems should be few and far between. Those looking to build a collection of high-end tools that are durable and effective should consider Wera’s extensive range of equipment. Several of the screwdrivers in this set, for example, benefit from touches such as laser-roughened tips – which causes them to bite into screws, preventing the tip of the screwdriver slipping out. A selection of screwdrivers come in this kit, including some with Philips, Pozidriv and flat-bladed tips. A lifetime warranty is also standard. 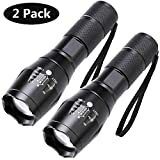 Those doing heavy-duty work in their garage, or on their home, will no doubt be keen to pick up a set of screwdrivers that can tolerate abuse. This Am-Tech set is a great candidate for such applications, as the screwdrivers are designed to handle all the punishment you can throw at them. Neat touches include grips featuring an integral hex head – which allows you to sling a spanner or ratchet on the end for extra torque. A three-year warranty is also standard. 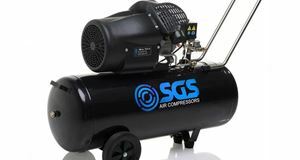 Looking for something that’ll fulfil all your requirements and don’t want to break the bank? 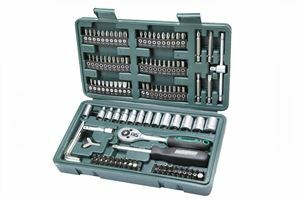 This Mannesmann socket and bit set is just what you need. 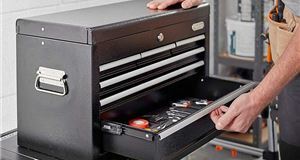 Besides a useful storage case, it features a whole host of tools – including a ratchet, a T-handle, a screwdriver handle and more bits and sockets than you can shake a stick at. It also comes with a ten-year warranty and, remarkably, often sells for around £20. 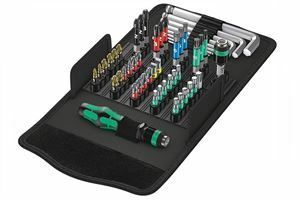 If the Wera screwdriver set caught your eye, but you want something a bit more comprehensive, then take a gander at this 52-piece set-up. It’s based around a driver, like some other kits here, and comes with a wide array of bits that simply attach to the driver to form a complete screwdriver. It also comes with some Allen keys and a slick storage pouch. It’s not cheap, compared to some alternatives, but the premium is worth paying.